I’m not going to get into the design ideas with you, but can tell you that your bench will be used on 4 legs not 2 and the wall. You do not need a big heavy duty hinge for it. HD sells some piano hinges that will work just fine, or use a pair of 3” door hinges. As for gas shocks, you wont need them either. 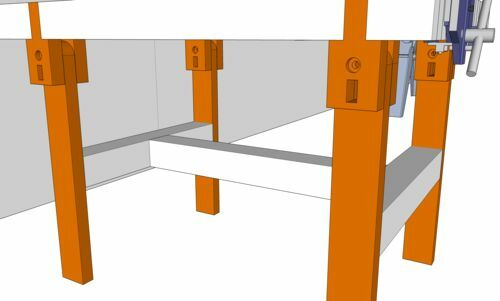 The bench will be supported by the wall when raised or lowered and will not be too heavy to handle. Lowering the bench: I agree that you should be concerned about the bench weight when raising, lowering. Since you have the dual goal of minimal storage space but also strength, the bench is expected to weight quite a bit. You don’t want to be trying to hold it up and walking backwards to lower it without some type of assistance or safety measure. Option 1. A full size truck hood is fairly heavy and gas shocks for that application would probably help give a little support when lowering. They’re cheap enough to try. Option 2: Install an tie down ring on the edge of the bench and on the wall, then use a small rope block and tackle to raise and lower the bench. Has the advantage that you never have to actually stand underneath the bench during raise/lower. Use a quick connect on the bench end and just let it hang against the wall when not in use. Add a mountain climbing safety catch (the kind you squeeze to let rope out) and you now have a easily controllable solution which is intrinsically safe. If you let go of the release for some reason, it’ll just lock and the bench will stay where it is. Even though it’s tied to the wall, I think you’d want to consider racking. The folding legs essentially have zero racking resistance, so you might want to consider adding a diagonal brace(s) from the top of one leg set to the other or insuring the hinge mechanism is sturdy. You don’t want to work the wall mount loose over time. I like the idea (you can check out my work table with folding tool stations in my blog), you just have a few special concerns to get a functional bench. I’ll be interested to see how it turns out. Your design looks like you plan on a VERY heavy unit. I would think just lifting it into place and pulling it down safely may be an issue. Mike, thanks for the suggestions – I considered the rope method and figured i’d have to use this in addition to the gas springs anyways. papadan, good call on the door hinges (i’ve got a bunch of these laying around I can use). My intentions are to fashion this bench for a larger space in the future. Here is a flip up workbench I did a while back, there is a 2×4 that runs along the wall that actually supports the weight of the back side of the bench, the hinges only come into play when raising and lowering the bench. I can tell you that this design will support well over 200lbs with no issue and all i used was standard gate hinges. That could be a death trap with out some serious thought into raising and lowering it and latching it to the wall when not in use. For one the forward edge of the bench will be over 90” from the floor when raised, not a real convenient for reaching a latch unless you are tall. Definitely you need some type of heavy duty positive fail proof latch to hold the thing up. What kind of measurement is 30 37/64”? I would round that a bit if it was my project. It was just over the weekend, Bondo, that I found myself cutting a 2×4 to the precise length of 30 37/64”. Was it intentional? Uhm, sure, I guess so. Someone in the last six months built exactly this and I want to say used gas shocks. Sorry can’t remember who. The gas shocks for tonneau covers are inexpensive and probably about right. Treadmills also use shocks for counter balance. If you plan on working with hand tools I wouldn’t depend on hinges alone, the back and forth will pull the screws out eventually. I think I might try to figure out some sort of locking mechanism like a deadbolt or pin I can engage while the table is down. What about the leg pieces that stick into the table? Should I do a dove-tail like cut on it or will it be fine squared off? You could add a couple of pulleys at the ceiling, add rope and weights (sort of the way old windows used sash weights to ease opening) to help with opening and closing. Unhook the ropes when it’s down so they aren’t in the way. My FIL is suggesting I look in to Extira (http://www.extira.com) for the bench top – any one have any experience with this product? Need some further guidance on these leg joints. I’ve revised the bench-to-leg arms to beef up the joint but now I’m at a roadblock. 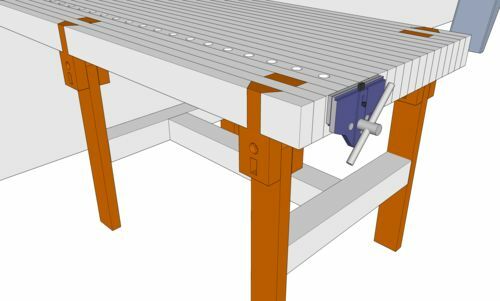 What sort of hardware do I need for the pivot points and is there a removable contraption I can craft to lock the 2×4 legs to the benchtop arms to minimize/eliminate racking? I started going down a 2×1 route that could be slide in and out of a slot just underneath the pivots but I’m not sure this is the best solution. Thoughts? I eliminated the back legs and instead made a support drop all the way to the wall. Figured this was easier, especially since I’m already attached across the width of the bench. This reminds me of a swing top table I was designing where every solution presented a new problem. So I scrapped the idea and went with a hinge. I think the hang up here is the leg connection. Your folding design will be so bulky that you might as well have a fixed bench. I agree with Rick. Since the bench is attached to the wall at the other end, it cannot really wobble or sway so is the sliding lock really necessary? Since it looks like the bench will be pretty heavy, it may be pretty awkward trying to get them to line up properly with one hand while also lowering the bench. 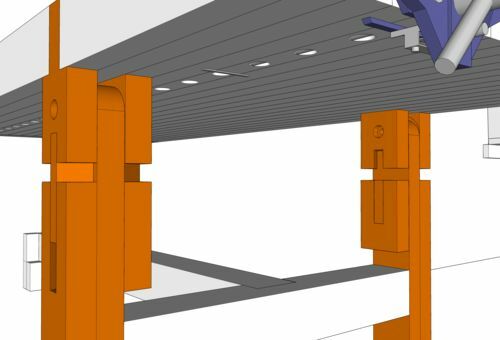 Don’t forget that the top will move in an arch so it might not even be possible for it to slide together/apart since the joint has to move in a straight line. It is an interesting design idea, though. 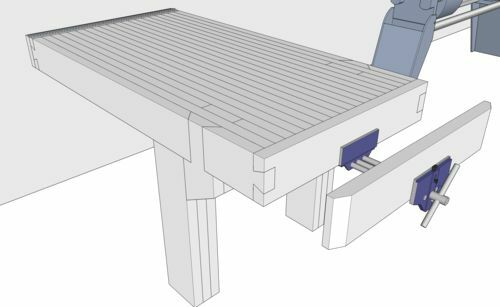 The easiest and maybe just as effective approach might be to just use basic strap hinges to attach the legs to the underside of the table so that the weight of the bench ends up sitting on the top[of the legs once it is down. I have a Yost m7ww vice (https://www.amazon.com/Yost-Rapid-Acting-Wood-Working/dp/B015Z8OTRG) but I’m trying to find a place for it in this setup. Would it work on the tail of the bench like in the photo below or should I offset it to the left side and half the size of the wood jaw? That style is better designed to attach a wide face to and utilizes the entire end of the bench for the inside face (and it will look better too :-). Personally I would mount a front vise on the end and maybe put the Yost woodworkers vise you have on the side of the bench. Let me float another stinker across the parlor… problem with fold up benches is that you’ve got to clear EVERYTHING off of them to fold them up. It seems like the solution, (though I’ve never seen one as hefty as your planning), but it winds up that the bench never gets stowed because it’s too much work to get all the stuff cleaned up or put somewhere else. 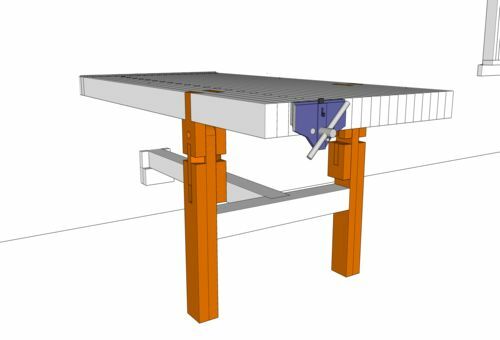 Maybe scale the bench to fit your space available, and look at a torsion box type of assembly table for bigger projects that you can knock down. I use a door & two B&D workmates for bigger builds when I need it. I’d vote for a wall hinge along the length of the bench so as to only have 2 legs. Much simpler and you only have to lift up to eye level. Add swing section (made of metal or wood) on the wall to hold the bench top up against the wall and out of the way.